Matt suggested we top the pizza with some of the fresh summer vegetables that are filling our fridge. We started with a layer of grated Fontina cheese. That was topped with a sweet onion from the farmer's market that I caramelized. Next came fresh sweet corn kernels straight off the cob, not need to cook them first. That was all topped with halved cherry tomatoes & pieces of raw zucchini. This was the tastiest pizza. 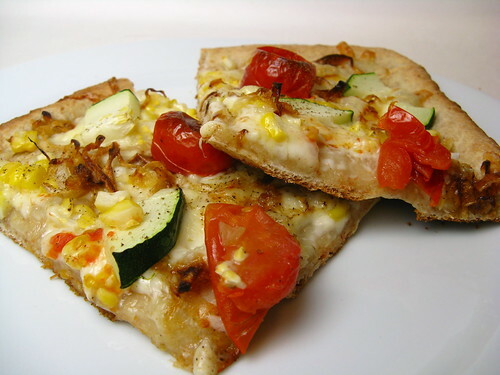 I think sweet corn may be my new favorite pizza topping. Stir the water, yeast, honey, garlic powder & olive oil together. Stir in wheat bran. Stir in the flour 1/2 cup at a time. Once you can't stir it in anymore dump it on a floured surface & begin kneading it. Knead in more flour until you have a soft, smooth dough that isn't sticky (I do the window pane test.) Oil a bowl & put the dough in it. Turn to coat. Cover with a towel & place in a warm place to rise. Let rise for 2 hours or until doubled in size. Oil a baking pan. Spread the dough out & cover with toppings. Bake at 450 F until browned about 15 minutes. Oh yes! This looks sooo good. We just had our first sweet corn (grilled) this weekend with the in-laws and now I want it on everything!! This looks like the perfect summer pizza! *drool* The Hippy and I are always on the look out for an excellent pizza crust. And your pizza looks a lot better than the stuff he brought home from Z Pizza last night. If I can't ID it, I won't eat it. cinnamon in pizza dough? now THERE'S an awesome concept. i like the idea of honey, too, and your pizza is gorgeous. Honey wheat is my absolute favorite kind of pizza dough, but I have never thought to make it! This recipe looks super easy... will give it a try on my next pizza night!! Oh very nice. I usually add some brown sugar to my pizza dough but honey sounds really good. Where did you go to college in Ohio? Theres something about honey and wheat. And in the King Arthur whole grain baking , they suggest orange juice as well. I think cinnamon would be great in there too. Isnt fun to try and replicate something. Yup, I know, I am a food geek. man that crust looks good. I haven't tried fontina on pizza, I must. This would be a great way to use up some of the veggies from my garden! This sounds really great! I love making my own pizza and the fontina cheese sound like a great add. How long do you usually knead for? I have never once had dough pass the windowpane test. I always thought it was a myth!